This is Joe. See Joe sell comics? This is Joe. Joe runs the finest comic book shop I have ever known; not because of it’s size or scope, but because Joe is not some skeevy, smarmy comic book wierdo. He is a member of the community, a small business owner, a “chamber of commerce” sort of guy. He goes out of his way to remember your name, to welcome you into his shop, to take care of his employees and to make his customers feel like family. He is every bit (if not more) the professinal that any number of people I know in the community with multiple capitol letters after their name. He is a credit to the community and as fine a sole-propriator as you will ever meet. 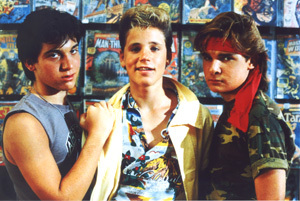 Filmed at Joe's shop... ages ago. (if only Joel Schumacher had stopped there and not gone on to ruin the Batman franchise). I’ll have you know that every single one Joe’s grandkids has graduated college… two from Harvard. He’s a legend in the area, everyone knows him and he knows everyone including all the oldschool comicbook legends: Sergio Argonis, the founders of the San Diego Comicon, John Byrne — and my kids. Dork-Dadism #47: When my son was born I thought it would be cool to start collecting for him every “Action Comics” (Superman), “Detective Comics” (Batman) and “Superman/Batman” published after his birth. The same month my son was born we moved cities to be closer to my work, and I needed to find a new comic book dealer… er, pusher… er, um… salesman. I found Joe’s shop, spent some time talking to him and now every month he sets aside those three titles for me, runs my credit card, and keeps them stored in bags and boards until I’m able to swing by and pick them up. Next month it will be 3 years running. At first I used to hit the shop every 2 or 3 months as my schedule would allow, but now as my kids get older I’ve started taking them with me. My boy loves it. He loves to walk around the shop and name all the superheroes he sees on the walls. He loves it that Joe recognizes him, says “hello” to him by name, and always has a free comic book for him. 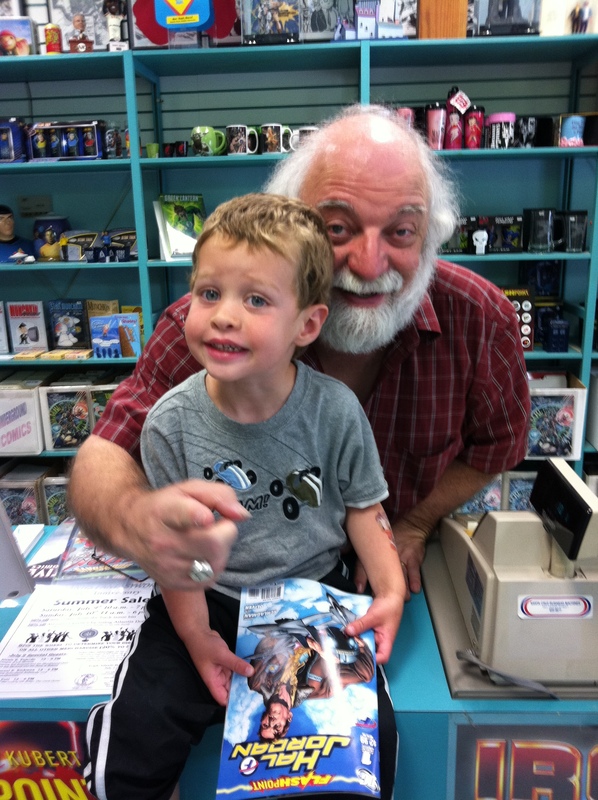 It’s become one of “those things” — hopefully a sweet memory that my son will carry with him long after Joe closes his shop and comicbooks go the way of the do-do. Who knows if my son will ever get into comic books. They certainly aren’t for kids anymore. The images and the writing are not the sort of thing I’d feel comfortable exposing my young child to. They’re a hell of a lot more expensive than they used to be (these days between $3-4.00. I really miss the days when all I had to do was collect one $8.00 monthly newspaper subscription from one of my paper route customers and I could juice up on enough $0.65 and $0.75 comic books to last me the entire month). And the comic book industry on the whole is in drastic decline. What I do know is that in my garage there’s a box filled with 3 years worth of untouched Superman and Batman comicbooks that my son is, as of yet, unaware of. Whenever I head off to Joe’s place to pick up my son’s comics my wife likes to say something like “Oh yeah. You’re getting comicbooks ‘FOR HIM’ (doing the finger-quotations thing)” – presumably because my boy isn’t old enough to appreciate them yet. The truth is, they are for him. I haven’t opened or read a single one in the three years since I’ve started collecting them. The initial impulse to save those comics came from the thought that it would be something cool I could do for my son if/when the day comes that he gets into comicbooks on his own. But this exercise has become more than that. Now it’s a ritual that I share with my kids. When we pass by Joe’s shop in the car my kids both wave out the window and yell “Hi, Joe!”. When I walk in there with my son or my daughter I’m proud to show off how amazing they are to another professional in the community whom I have a lot of respect for. They have big, genuine smiles for him. He has big, genuine smiles for them, and we all have this little ritual, a small part of our larger lives that we all share and is totally positive. Those are memories — real, forever memories. The comicbooks are just a bonus. That is so great, and I love the ritual and connection of the whole exercise. like anything in parenting it is bigger than just the comic book. It’s the story of Joe and the connection between your past and their future. You’re so right. It’s more about sharing the time, the experiences and the memories than it is the comics themselves. I wish I knew Joe. He sounds awesome.